You may not know this, but it is a requirement of all Presbyterian seminarians to do at least a 3-month unit studying pastoral care in a clinical setting. No matter the hospital, no matter the setting, this always ends up being a very intensive way to learn pastoral care. But, It also ends up being very enriching, and meaningful. You learn how to be present with people in some of the most traumatic and raw moments of their life, and it shapes you as pastor. My roommate, Craig, in seminary took on his clinical chaplaincy internship at Atlanta’s Children’s Hospital. As you might imagine working as a chaplain in children’s hospital can be a particularly difficult appointment. You are meeting with children who are sick and working with the families who are in the midst of a lot of grief and sadness. It is a job that is both beautifully joy-filled, and also very sad and traumatic, all at the same time. Craig developed what I thought was a pretty unique way to help him process the events of particularly hard days.When Craig would get home from work, he would turn on the tv watch children’s television and movies. After a day of complex medical situations, intensive prayer, and holding people in the midst of tears, Craig would flip on the tv.. and watch cartoons and shows designed for children. For Craig, this was more than just some escape. This practice helped him to better understand and relate to his patients. BUT more than all of that on a personal level, this practice was a return to innocence that helped Craig to remember to hope and dream. These shows helped to restore him to love and remind him of some of the most basic and important ideals in life. that was going to talk about guns in the wake of the parkland shooting. and personally a very tiring week, for my family, and also the staff of our church. Today, if you’ll humor me, I’d like to borrow my friend’s Craig’s strategy and interpret our gospel story today through the lens of Children’s television. Now as you know, I’m the parent of a toddler and in particular, I am a parent of a toddler who has to spend a lot of time indoors these days, PBS Kids has lately been a comfort to him on particularly tough days. So I’d like to begin our journey of understanding Jesus healing the blind man with a show on the Island of Sodor… with Thomas the train. Thomas is, of course, a precocious train engine, and star of the show “Thomas and Friends”He sports a blue paint job and the spirit and personality of a preschooler. As a pastor, who sees theology even in children’s television programming, this theme of the show has always bothered me. This show teaches that Your value and your worth is directly related to how useful you are. You are only shown love when you live up to the bar set for you. If anything goes wrong, if you show any error, if you step out of line at all, you are no longer useful. This was very much the context we see in our gospel story today. As unethical as it is, the blind man was not seen as useful to his society. His disability otherized him, made him continually seem different to everyone else. The world around him attributed his blindness to sin. They saw it as some sort of punishment from God. And because of his disability, He was outcast from society, forced to live a life as the poorest of the poor, his only option for survival was begging. This was his life, day in and day out, sitting along dirt paths, and relying on whatever spare change he could scrape up. Jesus values this man inherently, for exactly who he is. He may be the first person to do so! He values this man, and beyond that, he sees that God’s glory is being shown through him. And in an intimate act of love, he doesn’t ask the man to change, he doesn’t ask the man to come and meet him, Jesus goes to him. He meets him in the same dirt and mud he sits in. He digs his hands into the muck and grime of his life, and with this same mud, he cures him. He enables him to see for the first time in his life. He is literally brought out of the darkness of his life into the full light of God’s Glory. Mr. Rogers’ may be a better example of Christ’s love than Sir Toppem Hatt. He is another beloved Children’s Television star and an ordained Presbyterian minister I might add! This past week marked 50 years since his show first aired. In the midst of the coverage, I found an article that talked about a small but meaningful detail about his show. Mr. Rogers kept fish on the show, he would feed them every day as a way to teach children about the importance of caring for other living creatures. One Day, Mr. Rogers received a letter from a 5-year-old girl named Katie. She was blind, and she was writing mister rogers because she was worried about his fish. Since she couldn’t see him with his fish, she was concerned that he wasn’t feeding them anytime he would do feed them without saying he was feeding them out loud. Her father added a note on Katie’s letter that, this really worried her, and she would often cry about not hearing about the fish being fed. He listened to Katie, and because he loved and respected her he took steps to heal what was hurting her. But that involved getting down to her level and changing the way he’s done things. Mr. Rogers met her in the muck and complications of her life, He got down to her level in order to see ways that he could change, and through this act of love, he was able to change and bring about her healing. This is what Christ’s love looks like. 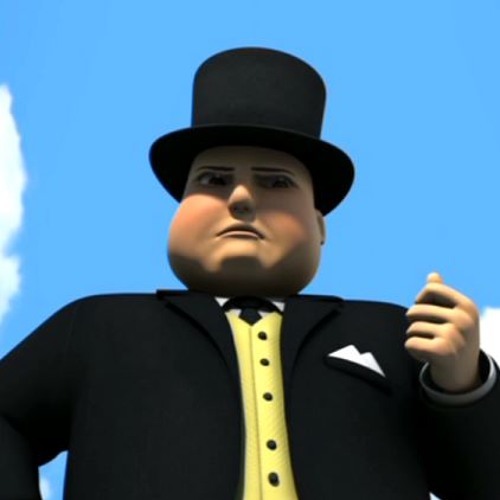 Unlike on the Island of Sodor, In the Kingdom of God, your value is not tied to your usefulness, your value is not related to how well you perform, what you look like, how well you fit in, how good you are. In the Kingdom of God, you are valued simply by being you, being the you that God made you to be. This is how Jesus saw the blind man, he didn’t see him for his handicap, he didn’t see him for his poverty, he saw him, and loved him for who he was. In the Kingdom of God, You are met where you are, you are understood for who you are, and you are loved. So hear this Good News, God loves you exactly as who you are. All the traits and flaws that society has told you that you have, God loves you with them. All of your physical attributes that magazines and commercials have told you were less than ideal... God loves the you God made you to be. Friends may you be found in whatever dirt you are sitting in. May God join you there, and in all of his love and compassion, may God heal you.